Journey through an amazing, immersive and terrifying world with BioShock. Caught between powerful forces and hunted down by genetically mutated citizens, you will come to grips with the mysterious and fascinating world of Rapture, a distinct Art Deco underwater utopia gone mad. BioShock not only challenges your capacity to adapt and survive, but brings to question your values and commitment to the inhabitants of Rapture. With smart and adaptive AI, no encounter ever plays out the same, while numerous customization options give you an experience that adapts to your playing style. Choices and consequences - Make meaningful choices and mature decisions, ultimately culminating in the grand question - do you exploit the innocent survivors of Rapture. or save them? Your average shooter game. Blood and screams. I don't know what the hype is about. This game is just like any other out there. Lots of blood and screams. What else is new? I get it, many people are psyched with the storyline, and I have to agree is a little different (if you have the time to read through the tons of "logs" that explain what the game is about, which I don't have). It'd be more exciting and appealing, if all those long logs were actually narrated by a high school dude. I didn't read any of them, at all. Bioshock. A game like no other. Note: there are basically no important spoilers here. Just minor gameplay and story spoilers which aren't a big deal. Wow. I've never had a videogame experience like this one. Everyone should experience this game at least once, even if you might hate it. And actually, I hated it after the first few hours of playing. Luckily I plowed through the rough patch in the beginning. This isn't a run and gun shooter. You have to think. You have to use strategy. You have to search for stuff, figure out what weapons and plasmids and tonics you're going to use, and figure out how to hack. I wasn't used to this because lately games aren't complex. Games are afraid these days to be hard, we wouldn't want to annoy the player. Before Bioshock I had just beat all the missions in Saints Row 2, and in that game you basically show up, shoot everyone on site, and you're done. It was too easy. It's just a matter of getting it done with basically very little thinking involved, with gameplay or story. Don't get me wrong though SR2 is a lot of fun and I loved it. Bioshock throws some challenges at you. First there's the story which is not easily explained and put on a silver platter. There are no long cutscenes. You're thrown into this eerie underwater world that resembles New York's Times Square. The look of the game is beautiful. You get bits and pieces of information along the way from your audio guide Atlas, and these audio diaries left behind on recorders throughout the world. If you really want to understand what's going on you have to listen closely, and it's worth it. Because if you don't listen you'll miss a lot of stuff and that takes away from what this game is all about. There are interesting themes and ideas to ponder. That brings me to the voice acting. It was top quality. My favorite being Andrew Ryan. He sounds exactly like he should as the leader of this city, and he has some great quotes. He makes it hard to decide whether to hate him or like him while he's throwing Objectivist type philosophy at you--that you may find yourself agreeing with. The tense atmosphere of Bioshock never lets up. You never really get a chance to relax and take a breath. There's these crazy splicer enemies walking around and sometimes you can hear them off in the distance ranting away. They sound sad and desperate. You have to tip-toe around every corner because you never know what's going to jump out at you. There's turrets ready to shoot at you, and the security cameras that you dread, because if they get a long enough look they set off alarms which triggers flying bots that are a huge pain. As you're walking around the levels you can walk right past one of your enemies, the Big Daddys. It's funny how you can walk right past them when they're in non-attack mode, knowing that eventually you're going to have to battle them, ultimately to make a decision about the little girl they're protecting: a Little Sister. And in the first half of the game they are a tough battle. Later on when you get some decent weapons they become much easier, thankfully. The best level for me was Fort Frolic. It's the centerpiece of the game. I would like to talk more about it but I will avoid spoilers. I'll just say that there are moments that are the most surreal I've yet experienced in a video game. There are scenes that a lesser game would have used a cutscene to present. In Bioshock you're free to walk around while this cutscene-like stuff is happening. The whole thing is colorful and brilliant. I found the hacking minigame to be addictive. It's a nice little diversion to take a break from the regular gameplay. But that doesn't mean it isn't stressful. To be honest at first I sucked at it. I used a few tonics to make it a lot easier as the game progressed. Sometimes it's damn near impossible. You can even decide how to deal with these things, whether to spend an autohack tool, buy it out, use tonics, ignore it completely or just try to hack it and risk setting off alarms or get shocked by a short circuit. That's what I liked about Bioshock. Even in this little minigame, they give you choices. It's up to you what strategy you're going to use. There are a lot of different weapons and plasmids to use, but I have a feeling a lot of people rely on the same trusted ones, like electricity. I tried experimenting with all of them. I noticed the guns are underpowered in this game. Which is good, it forces you to strategize instead of just blowing everyone away. Thankfully they got the shotgun right. As we know there's nothing better than blasting somebody ten feet with exploding buckshot. Another nice little thing which adds yet more gameplay is the camera. You can research your enemies by taking pictures of them, and you gain different bonuses depending on picture quality. It's funny when a splicer is storming at you like like a maniac, before you fight them you're frantically trying to hurry and get a good picture. Bioshock can be difficult at times, especially if you try to rush. To ease things there are Vita-chambers spread throughtout. They respawn you close to where you died, and any enemies loss of health remains. So you can keep dying and keep trying and some people complain that makes the game too easy. But who wants to keep dying over and over until you get it right? I like to play right in the first place. Just because the chambers are there doesn't mean you should use them as a crutch. Not to mention you lose all your health kits and start again with very little health. The chambers didn't make the gameplay easier, just less frustrating because you don't have to redo the same thing over and over. One of my problems with the game is switching between all your weapons, ammo and plasmids, especially in the middle of a fight. It can get awkward. Sometimes it isn't smooth and mistakes are made. There are also a few framerate problems here and there. Other than that the game looks beautiful on the PS3, particularly the water, which is gorgeous. I was also happy there were trophies and I racked up quite a few. Towards the end of the game I was getting disappointed because I didn't want it to end. That's why I started it again on hard mode. Games like this only come around once in awhile...actually they never come around. There is no game quite like this. "What is the difference between a man and a parasite? A man builds, a parasite asks 'Where's my share?' A man creates, a parasite says 'What will the neighbors think?' A man invents, a parasite says 'Watch out, or you might tread on the toes of God...'"
I bought this game based on some of these reviews, but what nobody has mentioned yet is that this game is horrific--but many may actually like that. I will pay more attention to ratings, as they do describe the gore and mature content. Simply put, Bioshock is a horror game. The first hour I played this game I thought it was just any other FPS but I turned out to be wrong. Took a little to realize what was going on and what you can do in the game and you realize how good this game is. Great story, good weapons, plasmids are incredibly fun, hacking is a great change of pace and addicting. Decisions on plasmids and tonics are a great touch. A must play for the PS3. "No Gods. No Kings. Only Men." When I first got Bioshock, I really wanted to enjoy it, I really did. The beginning was interesting and had my attention, but after that it got old fairly quickly. Often it would go from too easy to semi-difficult in a hurry. One moment I'd be moseying along downing splicers left and right with my wrench, then the next a Big Daddy would've clobbered me. But overall, it's not very difficult. You come back to life and nothing has reset, so any previously done damage stays there, which makes fighting Big Daddies not as exciting as I had hoped. Really, it seems like the biggest challenge here was just not getting lost and not losing interest. This game is a must-play for this generation. I've been playing it for a little over 1 week, and I just know I'll go back to it again and again. It has a compelling story, good voice acting, a cinematic quality overall that can create creepy moments you'll love. The replay value of this game is fairly high as well. There are three different ending, depending on your choices in the game. There are TONS of trophies to be had. Within the game itself, there are weapons which you first collect and then upgrade, you can invent items through the collection of goods, you collect plasmids and 3 different types of tonics, and there are audio diaries that you can collect as well. All of these additions to the game push you forward, along with the story. Each level is a large map of interconnected rooms and hallways. You can either follow your goals and finish quickly, or explore all the different areas, which is beneficial. There are a bunch of hidden corridors and items throughout. 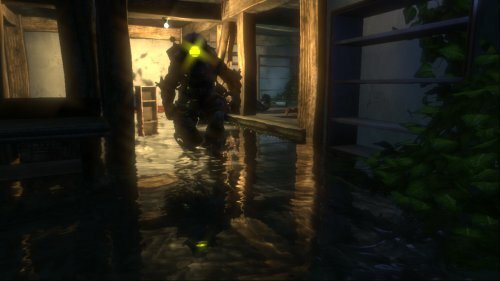 Bioshock is truly the FPS of the year for the PS3. It has a great storyline and the weapons are great. It's so different than any other shooter you will play this year and lets not forget it's just so much fun to play!! Feels like you're inside a horror movie! This is one of the best ever!!! Must play for first-person shooter fans! A must buy if you own a PS3 and haven't played this yet. The overall art direction is gorgeous, with its emphasis on Art Deco and mid-20th century advertising. The plot is one of the more sophisticated stories I've seen in a game, with its references to Ayn Rand, free will, and moral choices. The voice acting and characterization of the various denizens of Rapture is also top-notch, with a particular nod toward Sander Cohen, who ranks up there with the Joker on sheer creepiness. Speaking of characters, Bioshock pushes its "M" rating to the limit. Definitely 17 and older for this one. On the critical side, I would have included an option for re-mapping the controller. In some of the heavier action, the frame rate chugs a little bit. Not awful, but this game is pushing the PS3 fairly hard. Also, the in-game characters could have been a bit less artificial-looking. Great game, gorgeous graphics and sounds. I'm into all the RE2, COD, Brothers in Arms and Dead Space type games, but this FPS is very unique and worth playing just to experience the unique gameplay. This is not a game that you should miss if you own the PS3. Every review here is accurate. There was one reviewer concerned about the respawning. IF you don't respawn you will never finish the game and it will become tedious. I started off at the medium level, recommended for those who are familiar with FPS. Tomorrow I'll begin at the hard level. Now the Amazon price is down to $44, its a no brainer what you should do. I haven't played Fallout 3 and am expecting RE5, but so far this is keeping me very busy and happy. Great job 2K. Jan. 27. I'm playing this the second time on "hard" and its great. After the first run through it appears to fly by. This time I'm making sure to find all the sisters. Great game!! March 11, I'm on my third time through, only harvesting the sisters on the toughest level. Way challenging, lots of replay value and I can't wait for Bioshock 2 in Dec 09. April 15: Sold RE5 and went back to playing this game. I purchased and currently playing the dowloaded content. The game also offers an opportunity to start a new game with all your weapons. end. First, I would've given it 3.5 stars if possible. Here's the deal. I realize the game is supposed to be great, legendary almost, but there's a number of things that I particularly didn't like. I'll just list pros and cons. + Unique powers like telekinesis and such, and using them is cool. + Graphics are too cartoony to be creepy or engaging. + The game's too dark (even with brightness up) to see a lot of the splicers until it's too late. + Too repetitive. Again, the special powers are cool, but you use them all the time. + Kills seem to be random. I'll hit one splicer in the head with a revolver once, and she'll die, then the next one will take 8 head shots. + On a similar note, aiming is too sensitive, so you waste a ton of bullets. + No block. If I'm gonna beat someone with my wrench, I want to be able to block their attack too. Melee's not fun without blocking. The story's great, but it doesn't feel much different from your average first-person game. If you haven't played Bioshock yet because you own a ps3, get it now!!! Under the Sea...But This Ain't Little Mermaid! Not since Resident Evil 4 have I gotten so intensely immersed in a game. What a cool game Bioshock is. Let me say up front that I haven't finished it, and I don't want to be finished. I have played for at least 15 hours and I don't get the impression that I'm even close to finishing. I'm sure that I could have gotten a lot farther in the game than I am a lot faster, but you can prolong the game by exploring areas that may not be the most direct route to your goal. And I spend a lot of time exploring. These little explorations are usually fruitful, because hidden throughout the expansive game are all kinds of weapons, perks and information about where you've suddenly found yourself captive: In the underwater city of Rapture. The game begins with you as the sole survivor of a mid-sea plane crash. You swim to what appears as a lighthouse, but is also the entrance to Andrew Ryan's underwater utopian city of Rapture. Did I say utopian? Well, that may have been the original idea, but the Rapture you ultimately find yourself in is the antithesis of a utopia. I believe the term is dystopia. You soon start receiving radio transmissions from Ryan, a guy named Atlas and a doctor named Tennenbaum with advice on how to proceed in the game. Unfortunately, the advice you get often conflicts. Atlas and Ryan are clearly at war. And I'm not far enough in the game to even know for sure whose side Tennenbaum is on...but I've got a good feeling about her is all I'll say. You are given goals and roadblocks o'plenty to prevent you from easily reaching your goals. The few people (called Splicers) left in Rapture that you run into have all gone stark raving mad, and they'll ruin your day if you let them get too close. And don't trip a security alarm; it'll summon armed drones and more Splicers. Oh yeah, that Big Daddy guy in the old fashioned divers suit on the cover of the game case...they're roaming all over Rapture. Big, slow, doofy things, right? Mmmm hmmm...word to the wise: Don't get it mad. Sometimes the Big Daddies have Little Sisters in tow that seem to be inspecting corpses (um, yeah, corpses) strewn around either because you did some damage or...something else did. Mess with a Little Sister?...Over a Big Daddy's dead body! Atlas says kill `em; Tennenbaum says save `em...what to do...what to do? You get all kinds of weapons and opportunities to upgrade your weapons. R1 switches through the weapons and R2 fires. A pistol. A Shotgun. A chemical thrower. A grenade launcher. You're well equipped. (I'm at the part where you're given the crossbow.) You even get a camera to take pictures that allow you to conduct research on your foes to increase the damage you can inflict on them and lessen the damage that they inflict on you (don't worry...all you have to do is take the dang picture; the research is done automatically). In addition to the corpses strewn throughout the game, so is ammo, money and other knick-knacks that will help you progress through the game. Just be sure to search everything if you want to maximize your strength. And speaking of maximizing your strength, one of the first things you get is Plasmids...or put another way...special abilities. Telekinesis. Pyrokinesis. And a bunch of other Plasmid "kinesises" are unlocked pending your ability to find them. Try picking something heavy up with your telekinesis and throwing it at your enemy...better yet, plant a few proximity mines on that thing before you toss it! Switch through your Plasmids with L1 and use `em with L2. You're also granted "tonics" to customize your character with. Stuff like armor, various strengths, first aid boosts, and secondary damage your enemies from your weapons or from just plain old being attacked. Really cool stuff. Like the Ganados in Resident Evil 4, the Splicers in Bioshock become quite annoying and redundant, but I suppose that's the idea. Your goals change all the time. Just when you think you've attained a critical goal...it backfires or you're immediately given another that requires backtracking...and then backtracking again. But rest assured it never gets boring. The eerie atmospheres and creepy environments that Bioshock's creators have put together are more than effective. Some areas are really creepy, and there's nothing worse than not being able to find your way out of those which isn't always easy. But that's the fun! The game lets you save at any time, and when you restart play it starts you at the exact place you last saved...not at the last checkpoint. Pretty cool. If you liked RE4 or those kinds of survival / horror games...Bioshock is for you. Add this to your cart. And watch for Bioshock 2: Sea of Dreams next year sometime. Graphics are great, good game to play in the dark...pretty spooky. I am not a huge FPS fan so on normal mode I was struggling and had to change it to easy which made it not quite as fun or scary because it became to easy. In fact it's getting downright boring so I'm going to switch it back to normal and get back into it because it really is a great game. Not what I expected AT ALL, this game sure through me for a loop at first. I thought I had it all figured out before I even tried it out, but the storyline is something very different and cool. I read all these reviews and took a risk, spent $40 for it and then cried. Totally awesome but in need of patches. First off this game totally rocks. It has, in my opinion, the best sense of environment I have ever seen in a game. The enemies react vocally and physically with eerie realism (As far as a man or woman shooting fire out of their hands can obtain anyway). They play dead, take cover, and are altogether unpredictable. The darkness of the levels only adds to the scares as well, along with the choices in music (OLD school 20's and 30's jazz and r&b) which gives the sense of an ugly world still trying to be beautiful. Like Hugh Hefner dating those nineteen year olds only way less gross and pedophilistic. Oh, and the combat has so many combinations to try out its simply amazing. Anyone saying otherwise either has no imagination or plays too many damn games. One of the BEST FPS ever developed. If you have a console (PS3 or 360), this is one of the highest quality FPS games you can buy. There is no multiplayer, but the single player campaign is well worth it. Most FPS I rarely play more than once, this one I have beat 3 times. There's not much that hasn't already been said by gamers and magazines etc, THIS GAME ROCKS! My Son loves this game, and has wanted it for awhile. He said it is everything a game of this nature is supposed to be. Shipping was fast, the item arrived in perfect condition and postage was very fair. Would you kindly play this game? How's this for a story? A man becomes annoyed with the current world, a world where the great are taken for granted and told that their toils are either for the people, for God or for the government. In response, he creates a fantastic environment, free from all of these turmoils. A place where all the great men and women of the world can create their own inventions without fear of consequence. In this place, men and women could do what they wanted. If this sounds like Ayn Rand's Atlas Shrugged, you'd be correct. However, in this particular case, it's also the background story behind Rapture, the under-water city that takes centerplace in Bioshock. Many words have been bandied about about video games and their ability (or inability) to become art; you have folks like Roger Ebert saying the medium as a whole can never attain that goal. My personal thought on this matter was that, as a medium, games haven't made enough strides toward that lofty goal. But Bioshock certainly takes a huge step forward. Andrew Ryan is a visionary the likes of which his namesake Ayn Rand would possibly write about in Atlas Shrugged. He exemplifies the qualities of a Randian hero and showcases Rand's philosophy of objectivism. He created the city of Rapture and filled it, much like John Galt in Atlas Shrugged, with the visionaries of his land. Rapture soon was a thriving city that emphasized science and growth and the importance of the individual. They dabbled in creating plasmids that changed a person's DNA, enabling them to do feats the likes of which had never been seen before. Flying over the Atlantic sea, you are Jack, a person who was destined for greatness, if you ask his parents, and whose plane is now crashing into the sea. Jack is apparently the only survivor of the plane wreck and swims to a lone building, a light house it seems, that beckons him onward. Eventually, he goes into a blathysphere and enters into the world of Rapture. But this isn't the Rapture originally envisioned in the pre-recorded film he watches as he journeys into the city. It is a city comprised of deadly machines, once-human monstrosities named Splicers who are insane and, of course, the Big Daddies and Little Sisters. Bioshock concerns itself with the gray area between right and wrong. This dichotomy between right and wrong is what fuels everything in Rapture. Roaming the landscape, the Little Sisters are twisted abominations of little girls who locate corpses (which they call "Angels") and harvest Adam from them with a long needle. More grotesque is that bottle at the other end of the needle that the Little Sisters drink from. Dutifully following them are the Big Daddies, giant brutes in ancient diving gear. These...things...are at the heart of the story and Jack's survival depends on them and whether he can harvest the Little Sisters or set them free. The conscience of the gamer is represented in two mysterious figures, Atlas (another allusion to Rand) and Dr. Tenenbaum. Atlas seemingly wants Jack to save his family and explains that the Little Sisters are anything but the human girls they appear. He nudges Jack to put them out of their misery and take the Adam they harvest so he can survive and save Atlas and his family. On the other shoulder perches Tenenbaum, another mysterious individual who created the Little Sisters and seems to want to do anything possible to save them. They are the obvious angel and devil sitting on Jack's shoulder, but the question is...which one is the angel? To go into further detail would be to spoil this amazing story. Along the route, twists and turns abound with moral, ethical and philosophical questions aplenty. What's interesting is the way Bioshock presents a stark opposition to Ayn Rand's philosophy of Objectivism. Rand's heroes always contain the same qualities that Andrew Ryan exemplifies. But here, the artists behind Bioshock seem to be questioning these qualities by presenting a situation so familiar to Atlas Shrugged, and yet, so far removed. It is literate, thoughtful, disturbing and moving. Even if the gameplay didn't live up to the story, Bioshock would be worthy just for this reason. Luckily, that's not the case. For the gun hungry, sure, Rapture is filled with guns aplenty and even presents opportunities for you to craft your own upgrades. But that is just scratching the surface. Everything goes back to the story. Plasmids are located across the ruined debris of Rapture and contain the keys to recreating your DNA. Some early examples of Plasmids are the ability to shoot electricity from your hands to being able to set things on fire to telekinesis. But these plasmids aren't only used for fighting. Minor puzzle-solving crops up, some of which require plasmids in the same way as gear in Legend of Zelda. The biggest puzzle is how to take down the game's variety of enemies. While you can definitely charge in, guns blazing and sometimes survive, cases will present themselves where such tactics will end with you on the bad end of the Big Daddies' drill. Instead, you can create your own traps and war zones. Using plasmids, the environment and, of course, your weapons, you can create elaborate traps that will bring a smile to your face. A lot of games coming out right now that use the Unreal 3 engine don't look as spectacular as they could. In particular, character models tend to look shiny and/or completely ugly. This is not the case with Bioshock. Everything comes together, from the disturbing scenery, the art deco architecture to the the insane creatures and characters populating the world. Shadows and lighting also create a sense of atmosphere that drips heavily, much like the water pouring down the walls. It's stunning. The only complaint (and it is minor) is that the frozen portions you can melt don't look very convincing. When things melt, they don't leave anything behind. The only reason it sticks out is that the rest of the game is absolutely beautiful and amazingly crafted. None of this would be as effective, though, without superior sound. And Bioshock has that (mostly) in spades. The voice work is stunning throughout and the actors provide a great sense of dread. The audio diaries do an exemplary job of providing the backstory, but also work the best in crafting dread and terror. Some of the most disturbing things occur listening to them. Unfortunately, sometimes the characters' lines are repeated too often, ruining the disturbing nature of their dialogue. Musically, the game is also amazing. It flits into the picture at key moments, increasing the tension before it will flow away. You might not even notice it's there, but that's why it's so good. You know, the funny thing about hype is how people react to it. Game journalists can go blue in the face trying to get people interested in forgotten gems such as Psychonauts, Beyond Good & Evil and Stranger's Wrath, and since they weren't financially successful they become these gems. When a game sells incredibly well and is hyped to the max (both of which fit Bioshock), people say "over-rated." Ignore the hype machine. I know you're tired of hearing about it. But give Bioshock a try, if you haven't yet. Download the demo for your PC or try it on the Playstation 3 Network. It is a game that's definitely worth everything that's been said about it and more. This game kept popping up when I'd look into games like Fallout 3 and Oblivion. I'm not much of a FPS person, so I really didn't pay much attention. Finally, I broke down and bought it after I heard a lot of good things about it. I'm really glad I did! Most reviewers will comment on the graphics: Beautiful, fluid, etc. I won't embellish much, but I will say that I have to agree with all the positive comments! It's simply breath taking! The music is also top notch! And the story, man... It's amazing! It really keeps you enthralled. One of the main complaints is the relative lack of challenge. I'll admit, things were on the easy side. But for someone who's not really into fast-paced FPS games, I didn't mind so much at all. I was allowed to play through the game, and enjoy the story without the stress I've experienced in other FPS games (I will admit, I'm not the most skilled of players.) Bioshock also has a survival mode, which claims that every bullet counts... I haven't tried it yet, and can't really comment. When Bioshock was first reviewed by EGM for the 360, I remember being green with envy. I even considered buying the Microsoft machine just to be able to enjoy bashing Splicer heads in with a monkey wrench. But I waited, and I was rewarded. Bioshock is a (deliciously) violent first-person-shooter that takes place in Rapture, a city beneath the sea. Rapture was built to be a land of free economy and free minds, but quickly descended in anarchy. Your character is aboard a plane that conveniently (perhaps too conveniently?) crashes directly above the entrance to Rapture. It turns out that Rapture was built by an ambitious and somewhat loony guy named Andrew Ryan. He's apparently lost it, and when arriving in Rapture your character is guided by the seemingly benevolent hand of a plucky Irishman named Atlas. The story of Rapture is told piece-by-piece through audiotapes that the character finds scattered throughout rapture. Bioshock is a FPS, so your character does carry a small arsenal with him at all times, like a pistol, shotgun, machine gun, grenade launcher, and crossbow. Each weapon can and should be upgraded whenever possible, which can be done at 1-time-use upgrade stations. The game also introduces us to Plasmids, which are genetic modifications that give the character some very unique abilities. Somewhat like spells in fantasy games, these plasmids allow the character to cast fire, ice, and lightning effects at enemies. However, these can be used in more uncharacteristic fasion, such as enflaming oil slicks, freezing security machinery to make it easier to hack, and zapping water to electrocute all who stand within it. There are also some really bizarre plasmids, like laying cyclone traps that launch enemies upward or unleashing a swarm of bees. Plus there's good ol' telekenesis, useful for grabbing those hard to reach items or launch corpses through security wires. There is no ammo per se for using plasmids, but rather Eve, which is injected via syringes found throughout Rapture. There is not too much variation in enemy types, but those that exist are more than enough trouble. I found this game quite difficult on Normal, especially in the mid-levels. There are Splicers, which are like gene-mod junkies. These come in 4 major flavors: typical thug, typical shooter, the infuriating spider splicer, and the even more infuriating houdini splicer (the latter two crawl on ceilings and teleport while launching fire, respectively). Early on, there are also a lot of explosive-lobbing splicers, but fewer as the game progresses. As if these freaks weren't enough, there are various security measures that can prove deadly and helpful. Gun turrets, for example, can rip your health to shreds in moments if you're not careful. Flying security drones, which are released when the character is caught on camera or when failing a hack (see below), will hound the character for 1 minute unless a shut-off switch (bring cash) is found. Economy is still alive in Rapture, despite being a soggy hellhole. Things cost money, which can be found in all sorts of places, even ashtrays. This moolah can be spent at ammo stations, health stations, general goods stations, and security shutdown. The heart of this game are the Big Daddies and the Little Sister and their special relationship. The former protect the latter, simply put, and can be found in varying numbers in each level. However, it goes deeper than that. Little Sisters are corrupted experiments in genetic modification that collect Adam throughout Rapture from the dead. The Big Daddies are their hulking protectors. The Little Sisters are the main source of Adam for the character, which is the stuff needed for expanded Plasmid abilities. To get it from the Little Sisters, however, you gotta take down the Big Daddy. Not easy to do, but there are strategies that minimize damage. My personal favorite is to use the BD as a bodyguard with a special plasmid (Hypnotize Bid Daddy), let him sustain damage for me against Splicers and security, and then take him down once he's been damaged. Once the protector is down, there's a choice to be made: forcefully and fatally harvest a large amount of Adam from the Little Sister, or compassionately save her but receive less Adam and a gift from their progenitor. This choice will affect the ending of the game, so choose wisely. Health is kinda strange in Bioshock. You have a health bar that can be refilled with first aid kits. If the bar is completely drained at any time, even with excess FAK, you die. When the character dies, he respawns without limit at Vita Chambers. Really, there's no reason to fear death. The biggest inconvenience is backtracking to where you were at time of death. You can also get a small health kick from eating the food found throughout Rapture, and you can similarly boost your Eve by drinking alcohol or smoking. Drinking too much will make the character temporarily drunk, with swimming vision and poor coordination. Fun, really; I never passed up an opportunity to get hammered in Bioshock. Hacking is another major aspect of the game; it isn't necessary, but not doing it will make this game way harder. Security bots, gun turrets, safes, vending machines, and health stations can all be hacked with varying degrees of difficulty. Hacking security makes it friendly to you and hostile to enemies. Hacking safes is the only way to get at their contents, which are usually quite the bounty. Hacking vending machines reduces costs, and hacking health machines lowers costs and makes it poison to enemies. Hacking itself is a grid puzzle-based effort, where you attempt to connect tubes that form an unbroken flow from point A to point B while avoiding alarm squares. This can be simplified through security Plasmids that grant bonuses to speed and difficulty. Down to the nuts & bolts of Bioshock: graphics, sound, and gameplay. All are done superbly. The world of Rapture is presented beautifully, despite being a briny nightmare. The graphics are some of the best I've ever seen, and was no perceptible slowdown or skipping. The sound effects are creepy and effective, mixing the upbeat attitude of the early 20th century with the grim state of a failed city. Nothing like listening to big band music while treading over rotting corpses, eh? Gameplay is a mix of old and new, with the use of plasmids really creating the uniqueness of the game. There are just so many ways to combine plasmids. For example, if you're particularly viscious, you can gear all your plasmids towards close combat with the wrench by adding chameleon, bloodlust, wrench mastery, and wrench freezing together. Otherwise, you can learn to master your TK plasmids by hurling a flaming corpse at another enemy and setting it on fire. It is for this reason that I'm going to play Bioshock again; I want what other strategies are effective. A masterpiece worthy of every minute of your time spent! Everything you have read about this game is true. The visuals, story, gameplay all come together in an impressive fashion. While this game doesn't do any one of these things above and beyond other titles, assembled together it is an absolutely exceptional piece of work that any FPS/RPG fan should NOT miss! FYI - the "save anywhere" feature really helps make this game even better! I really don't like playing first person shooters, not that there are not great ones out there to play, but for the fact I'm not good at playing then. But just to see I decided to download the demo for BioShock, and loved it so much that I bought the game. I am also pleased that you can choose the level you want to play, from easy to hard. It's easy to master the controls, the weapons and style of combat create an exciting play experience.